Beijing, the capital city of China, is well known for its Forbidden City museum, the Great Wall, and its cosmopolitan urban development. Beijing is much less known for its alarming level of waste production and the whereabouts of its waste. With a population of 20 million people, and an intense level of consumption and economic activities, the amount of municipal waste produced daily in Beijing has reached more than 20,000 tons in 2016. It is therefore not an exaggeration to say that Beijing is “besieged by waste” and that waste management has become a major headache for the city government. While this large amount of municipal waste, which ends up in landfills and incineration plants, is enormous enough, few people know that such waste has already been carefully processed and significantly reduced by an invisible group. This group is the waste pickers, exclusively composed of rural migrants from poorer parts of Sichuan and Henan provinces. The unofficial estimate of the number of waste pickers in Beijing alone is over one hundred thousand. This number was much larger when the global prices of raw materials were higher. 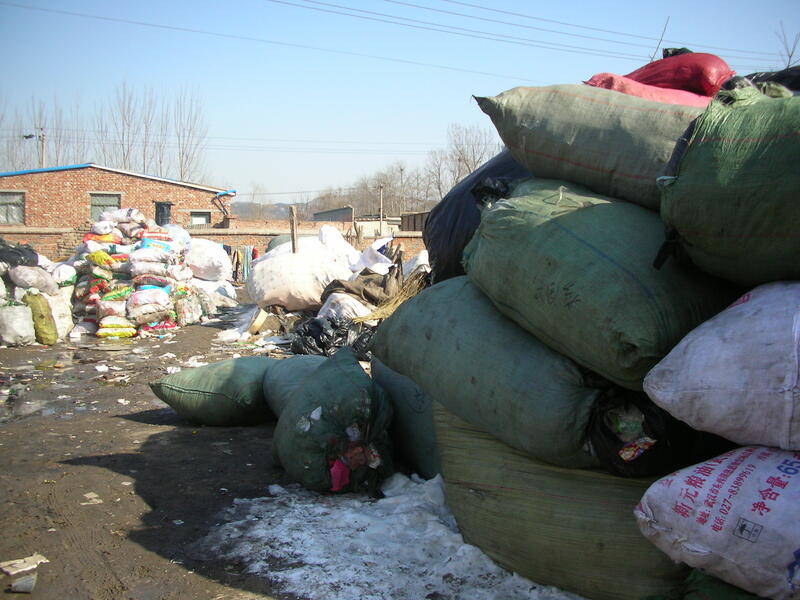 Unlike those in Mumbai and Manila, waste pickers in Beijing do not live on landfills. They are itinerant traders roaming urban spaces. Every morning, an army of waste pickers arrives at hundreds and thousands of residences, office buildings, shopping malls and hotels to reach the source of post-consumption discards. Many transport their “harvest” by peddling on bicycle-drawn carts. Some are able to save time and energy with trucks. The “harvest” typically is unloaded at their rented living quarters which have open space courtyards, located in “urban villages” off the sixth ring of the city. After spreading out their loads on courtyards, waste pickers sort out the valuable recyclables: plastic and glass bottles, newspaper, clothing, shoes, cardboard, foam, electronics, furniture, toys, plastic bags, plastic tools, miscellaneous wood and all kinds of metals. The most sought after waste items are metals, which sell at better prices than others. Those waste pickers who are able to make deals with construction sites gain access to some. Those who do not have any business deals perform extra steps to extract cooper from plastic wrapped cables or other electronic products. Waste pickers collect, sort and process discarded waste on a daily basis. Their work involves not only intense labor input and commitment to endure a polluted living and working environment, it also involves an entrepreneurial mind and skills to maximize the profit margins out of hundreds and thousands of plastic bottles and soda cans. They exert an enormous amount of labor in the process. If riding a three-wheeled bicycle with a cart filled with discards that weighs up to a hundred kilograms for two hours is backbreaking, the loading and sorting process in an open space is equally arduous, especially in Beijing’s extremely hot summers and cold winters. Male waste pickers often engage their wives to do the sorting together in order to be time and cost effective. The labor of sorting is physically very demanding as it involves a lot of breaking, squeezing, and pulling objects apart. It can also be dangerous as there are glass and sharp objects. Apart from the smell of rotten food waste and fetid liquid running everywhere, the major concern of these courtyard spaces is untreated pollutants. Yet in order to guard and store their piled-up recyclables, waste pickers often live in simple brick sheds within the same courtyard space. 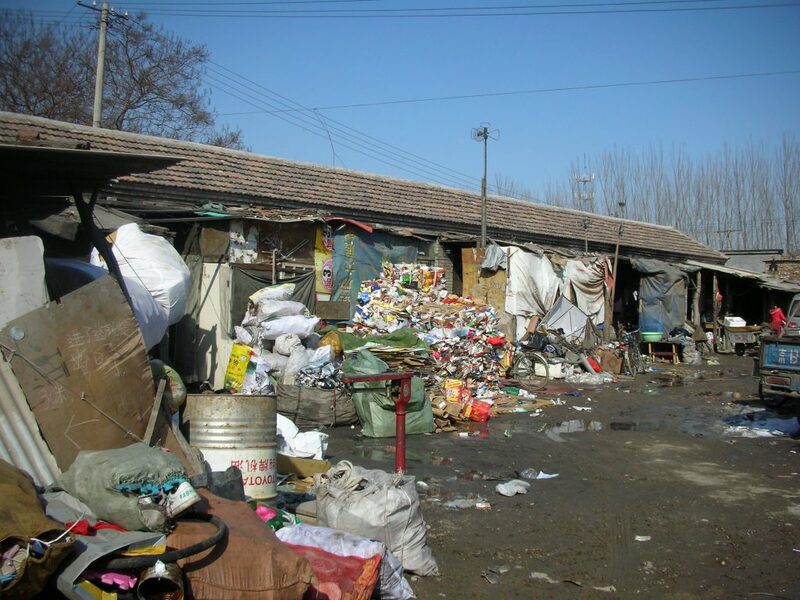 The arrangement of living with waste helps waste pickers not only to save the costs of living in the city, it also provides them with secured spaces for accumulating their recyclables, ready to be sold to factories located in neighboring Hebei Province or provinces even further away. The downside of this arrangement is that it attracts stigmatization towards the work and identity of the group. If one looked at the city from high above with a drone camera, one would see that the modern Chinese capital is literally surrounded by rings of “urban villages.” These urban villages used to be rural villages and farmlands. They have for the last several decades been slowly developed into patchy spaces of small factories, migrant workers’ dormitories, landfills, and what we call “waste courtyards,” (feipin changzi) alongside of dwindling farmlands. One would be seeing a lot more landfills surrounding the capital city and more serious pollution of all kinds, if it had not been for the work of waste pickers over the last several decades. Recyclables piled up in a “waste courtyard” in Beijing. Photos courtesy Ka-ming Wu and Jieying Zhang. The labor and contribution of waste pickers in Chinese megacities is seldom acknowledged. The majority of urbanites ignore them as either dirty rural migrants or petty traders. The government sees no needs to quantify this groups’ economic contribution to the city’s GDP. Perhaps the most overlooked aspect is the group’s contribution to waste reduction in the city. There are no statistics counting how much the group has contributed to reducing the burden on city landfills and incineration plants. Invisible in both official data and urban public spaces, waste pickers’ labor and their arrangements to live with waste have significantly alleviated the situation of waste besieging the city. In fact, the labor of waste pickers has in effect replaced or displaced individual and government responsibility to sort waste at household and municipal levels. The ability for waste pickers to reduce waste in Chinese megacities is nevertheless based on several conditions. First, a serious rural-urban divide in which rural migrants are eager to find urban opportunities is one underlying factor. Second, the fact that China is a major receiving country in the international waste trade (Alexander and Reno 2014) means that thousands of factories specializing in processing and recycling wasted materials from more developed countries are already in place. The existing infrastructure of waste trading allows waste pickers to plug in and profit from this lucrative business. The last condition is, of course, the enormous amount of waste generated in megacities such as Beijing. Many items remain unable to be recycled. Food waste, plant matter and used batteries are destined to go to the landfill. At the same time, as the global prices for waste products have plunged in recent years, more waste pickers are losing money in the waste business and many are leaving the industry. News reports are saying that even veteran waste traders now have big headaches selling their recyclables. The global prices of raw materials are not only affecting the livelihoods of millions of wastes pickers living on the margins of Chinese megacities. The prices are also directly determining the rate at which waste, both from domestic consumption and imported from outside of China, will be turning into more landfill surrounding China’s cities. This is the fourth short piece in a series of five which are focused on the generativity of waste and its various modalities of power in contemporary China and Taiwan. The series provides a follow-up to the panel “Living through Waste and Waste as Lively” presented November 21, 2015 at the 114th American Anthropological Association Annual Meeting in Denver, Colorado. Ka-ming Wu is Assistant Professor in the Department of Cultural and Religious Studies at the Chinese University of Hong Kong. Jieying Zhang is Assistant Professor in the Institute of Sociology at the Chinese Academy of Social Sciences. Wu and Zhang are authors of the Chinese book Feipin Shenghuo: lajichang de jingji, shequn yu kongjian (Living with Waste: Economies, Communities and Spaces of Waste Collectors in China) published by the Chinese University Press in 2016.